Each case is different but the problems are mainly the same. No matter how much space you’ve got, whether it’s a huge walk-in or a tiny closet or maybe no closet at all, there are some little tricks that can make a big difference. 1) Get rid of what you’re not wearing anymore. My general rule of thumb is 1 year. If you haven’t worn it – start a box or bag. Your clothes need room to breath and you need room to be able to slide things around. Some of the things you can do with those items: Have a party and swap with friends, give away, or donate & take a tax credit*. 2) Take out what doesn’t fit and have it altered if it’s too big. 3) If you’re wrestling with the amount of space you have and it’s too tight in your closet or drawers, you are probably constantly annoyed and don’t even want to look in them. Less is more. 4) If your drawers are too full and/or your closet is really small with these kind of ‘stragglers’ and you’re waiting for the day that you can fit into particular clothes again, you might want to rethink this strategy. If it’s hanging there, chances are that just looking in there reminds you that things feel too tight. That is a constant reminder that you need to lose weight. If you’ve been looking at it and feeling that way for a year, perhaps it’s time to let go of it and either buy something new or pare down your wardrobe. There is nothing wrong with that!I find relief when I cull my closets and drawers. It will make room for a new and breezy energy. But, if you just can’t part with them, try getting some Ziplock Space Bags. Think of this purging process as a way to bring light into your life. Yes, less is more! So enlightening to listen to the dialogue in my head when I approach my closet. Still, it’s tough to purge. I think I let things represent people. For example, if I get rid of a sweater I feel like I’ll hurt the feelings of the person who gave it to me. Silly, I know. But it is a problem for me. I’m especially bad at cleaning my closet. Everything I have I can think of at least one situation where I would need it and if I threw it away wouldn’t have it. So I keep everything. This has lead me to keep things for much longer than necessary. I will use your tips the next time I’m ready for closet purging. 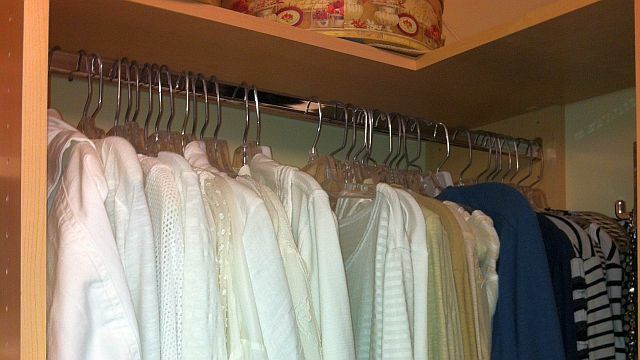 I think nearly every woman has space issues when it comes to their closet, myself included. This one year rule is a great way to determine whether or not something is worth keeping. I’ll try it (my closet has been a little stuffy lately). This is really good, Cindy! I struggle with “letting go” like almost everyone else, but I know that it’s only by letting the old, no longer loved things go, that we make room for the new more enjoyable things. Now if I can only put what I know into action. I have such a hard time with getting rid of things from my closet. Even if it’s been a year, I always tell myself that I will wear it eventually. Looks like I need some real help! Or some Ziploc space bags. I do really like the idea of swapping with friends; I think I will share this with my daughter if she is in the mood to do some purging. I need to purge! I’m reading this as I’m surrounded by my packed closet and stacks of clothes on top of my dresser. Thanks for the reminder and the inspiration! The one year rule of thumb is great! Chances are, if you haven’t worn it in the last year, it’s probably not gonna be worn in the coming year either… Your less is more approach to closet perfection is inspiring! I think it might be time to sift through my own closets and drawers. I like your one year general rule of thumb plan!